The award of Honorary Doctorate is a remarkable university tradition. By now the award has been granted for 31 outstanding figures of science, culture and art, whose achievements have been recognized by the world community. Academician of Russian Academy of Sciences, Honorable citizen of Saint-Petersburg. Honorable Doctor of SPbUHSS since 1993. Honorable Doctor of SPbUHSS since 1994. People’s Artist of USSR, Laureate of Lenin’s Award, Hero of Social Labor, Academician of Russian Academy of Arts, Honorable citizen of Saint-Petersburg. People’s Artist of USSR, Laureate of the State Awards of USSR, Prima ballerina of the Russian Ballet, teacher choreographer, Professor, Honorable citizen of Saint-Petersburg. Honorable Doctor of SPbUHSS since 1995. People’s Artist of USSR, Laureate of the State Awards of USSR and Russia, composer, Honorable citizen of Saint-Petersburg. Honorable Doctor of SPbUHSS since 1996. People’s Artist of USSR and Russia, Laureate of Lenin’s and State Awards of USSR, Hero of Social Labor, composer. People’s Artist of USSR, Laureate of the State Awards of USSR and RSFSR, Laureate of Lenin’s Award, musician, conductor. Vice-President and Academician of Russian Academy of Sciences, Nobel Prize Laureate, Duma of Russian Federation Deputy, Principal of Presidium SPB’s scientific center of Russian Academy of Sciences, studies supervisor of physics nanogeterostructure center of Physical-technic institute of Russian Academy of Sciences, doctor physical and mathematic sciences, Professor, Honorable citizen of Saint-Petersburg. Honorable Doctor of SPbUHSS since 1998. Laureate of the State Award of USSR, poet. People’s Artist of USSR, Laureate of the State Awards of USSR and RSFSR, Hero of Social Labor, theatre and cinema actor, Honorable citizen of Saint-Petersburg. Honorable Doctor of SPbUHSS since 1999. People’s Artist of USSR and Russia, Laureate of the State Awards of USSR and RSFSR, cinema director and scriptwriter. Honorable Doctor of SPbUHSS since 2000. Principal of Archaeology Department of Moscow State University, Academician of Russian Academy of Sciences, doctor of History, Professor. Honorable Doctor of SPbUHSS since 2001. Principal of Saint-Petersburg State Philharmonic, Conductor of Philharmonic symphonic Orchestra, People’s Artist of USSR, Laureate of the State Awards of USSR and RSFSR. Honorable Doctor of SPbUHSS since 2003. Principal of Saint-Petersburg Academic Ballet Theatre, People’s Artist of Russia, Laureate of the State Award of Russia. Honorable Doctor of SPbUHSS since 2004. Principal of Physical culture department, Merited laborer of Physical culture of Russia, Honorable citizen of Saint-Petersburg. Honorable Doctor of SPbUHSS since 2005. Academician of Russian Academy of Sciences, Laureate of the State Awards of USSR and Russia, Doctor of Chemistry, Professor. Academician of Russian Academy of Sciences, Academician of Russian Academy of Medical Sciences, Laureate of the State Awards of USSR, Russian neurophysiologist. Honorable Doctor of SPbUHSS since 2006. Principal of Maly Drama Theatre (Theatre of Europe), of People’s Artist of Russia, Laureate of Premium of Russian President, of the State Awards of USSR and Russia, Professor. President of the State University of the humanities, Principal of Institution general history of Russian Academy of Sciences, Academician of Russian Academy of Sciences, Doctor of History, Professor. Honorable Doctor of SPbUHSS since 2007. Principal of Russian Children’s Fund, full member of Russian Academy of Education. Principal of Philosophy Institution of Russian Academy of Sciences, Academician of Russian Academy of Sciences, Doctor of Philosophy, Professor. Honorable Doctor of SPbUHSS since 2008. Vice-President of Russian Academy of Sciences, Academician of Russian Academy of Sciences, Doctor of Economy, Professor. Honorable Doctor of SPbUHSS since 2009. People’s Artist of Russia, Actor of Saint-Petersburg Academic Bolshoy Drama Theatre, Honorable citizen of Saint-Petersburg. Honorable Doctor of SPbUHSS since 2010. Ex-minister for Foreign Affairs of Kingdom of Spain. Honorable Doctor of SPbUHSS since 2011. 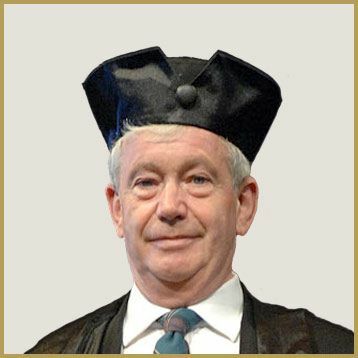 Judge of Constitutional Court of Russian Federation, Merited Lower of Russia, Doctor of Juridical Sciences, Professor. Study Supervisor of Philosophy Institution of Russian Academy of Sciences, Academician of Russian Academy of Sciences, Doctor of Philosophy, Professor. President of Moscow Bar Association, Candidate of Juridical Sciences, Merited Lower of Russia. Honorable Doctor of SPbUHSS since 2012. Vice-Chancellor of Edinburgh University, Professor. Honorable Doctor of SPbUHSS since 2013. Chairman of State Russian Duma Committee of sciences and scientific technologies, Academician of Russian Academy of Sciences, Doctor of Medical Sciences, Professor, Principal of immunology and physiology Institute of Ural department of Russian Academy of Sciences. Honorable Doctor of SPbUHSS since 2014. A legend of Soviet and Russian figure skating, Russian public and state figure, the Deputy of the Federal Assembly at the State Duma of the Russian Federation, a member of the State Duma Committee on CIS and relations with compatriots. Honorable Doctor of SPbUHSS since 2015. Triple Olympic champion, ten-time World champion, nine-time Europe champion, thirteen-time champion of the USSR. In 1972 became the youngest Olympic champion in the history of hockey.